from Black Gate 12, copyright © 2008 by New Epoch Press. All rights Reserved. “You’re late,” Leif said as I climbed out of the car. 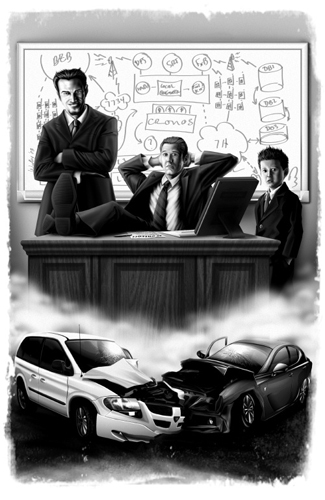 “You didn’t scratch your new Lexus?” A note of genuine concern crept into Leif’s voice. I swore softly, slamming the trunk and starting the long walk across the parking lot towards Door 10. The lot was packed today; the Libertyville facility employed nearly 3,000 people, and it looked like they’d all shown up before me. “Should I ask how that went?” I asked. I winced. Last time I’d seen Doug Cripen’s forecast, it predicted his division would make barely thirty. Which meant we were thirty million dollars light — and that’s if we made forecast, which frankly would take a miracle. Mike was the Corporate VP who ran the whole business sector; he reported to the CEO, and was Crip’s boss. Mike wasn’t known for his patience. Or for making idle threats, either. “Mike wants a plan,” I guessed. “Mother of God.” Cronos was still a fledgling business; hardly out of the research stage. We’d brought in barely three million dollars in revenue last year. Since we’d closed the ConnectAll deal, our forecast for this year had jumped to five. A nice bump, but a very long way from twelve. We were healthy, growing quickly, and had a bright future. If we could just survive being strangled to death by an insane parent corporation. ‘Poor bastards’ was right. Ken and his guys in International would be lucky to see five. “He can’t be serious,” I said. I flashed my badge at the security guard at the door, and lifted my case up for him to poke through. He gave a lazy glance and waved me though. “What do you think will happen if we miss twelve million?” I asked Leif. The thought of laying off half my staff made me sick to my stomach. Threats to my own job held little terror any more – I’d been in sales for nearly two decades, and faced that particular specter more times than I could count. But I’d hand-picked most of my people, and blown sunshine up a lot of skirts to lure them here. They were the best team I’d ever worked with and, more importantly, they’d put their faith in Cronos. And in me. Even dickless Troy, whom Leif had parked in my sales team while he prepared a real job for him, and who couldn’t sell Perrier to a Bedouin. “Yeah, I can do it,” I said. “Good luck with that.” Doug Cripen was boss number five for Leif. Leif had worked for him for less than a year, since the Cronos team had been moved into Crip’s division in the last re-organization. They didn’t get along. Unified was the company providing the back-end server for the Cronos service; without it Cronos didn’t have any kind of story, much less one Mike would believe. A man in his early thirties was emerging from the crowd ahead as I hurried down the hall. I was still in the engineering bay, but this guy wasn’t an engineer. His dark green suit fit him perfectly, and his shoes cost as much as many engineers made in a week. His mouth widened in a broad smile as he saw me, and he stretched out his hand. The guy was obviously a salesman, and I liked him immediately. “Actually, no.” I started backing away. “I’m running to a meeting. But I’d be glad to make some time for you this afternoon…” I looked him over for an ID badge or visitor’s tag with a name, but saw nothing. “I know where it is. I’ll see you shortly.” He stood quietly, hands clasped and smiling, watching me recede down the hall. “Who was that?” Asked Leif. The complete version of “The Soldiers of Serenity” appears in Black Gate 12.